I had this on the revision A board and though it was fixed but it has appeared again. The symptom is at power on or a reboot you end up with only the power light on. I was able to reproduce it with my board not installed. It appears this is an occasional problem with the BBB and likely what I was seeing with the REV A board also. This is one persons solution. I found other similar descriptions. I didn't find a solution that was correct for my board running Debian. Below is what I did. Backup your BeagleBone before performing these steps since it they go wrong you will have to reflash your board to recover. I hope to create a flasher image you can use that will put everything on you need. Estimate for my board is 230 mA. Power usage should be OK but not the margin I thought I had. If you don't use both MicroSD and Ethernet the margin is fine. Using the USB port for extra storage doesn't use 3.3V and frequently is faster. If you use the expansion connector you must limit load on 3.3V. Plenty of 5V is available which you can use a regulator enabled by the BBB 3.3V to generate a local 3.3V if needed. 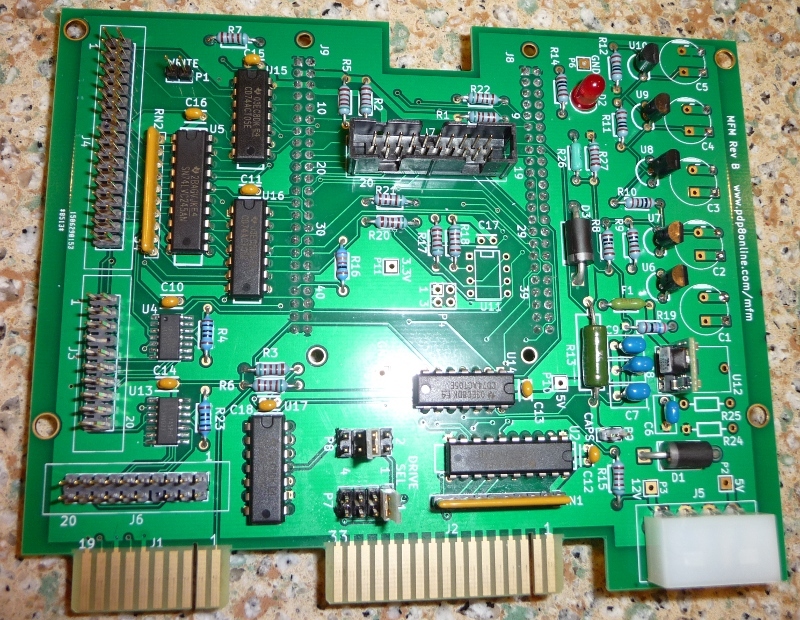 Below is the board assembled. I was asked if I could use the shrouded connectors that I had on the BOM instead. 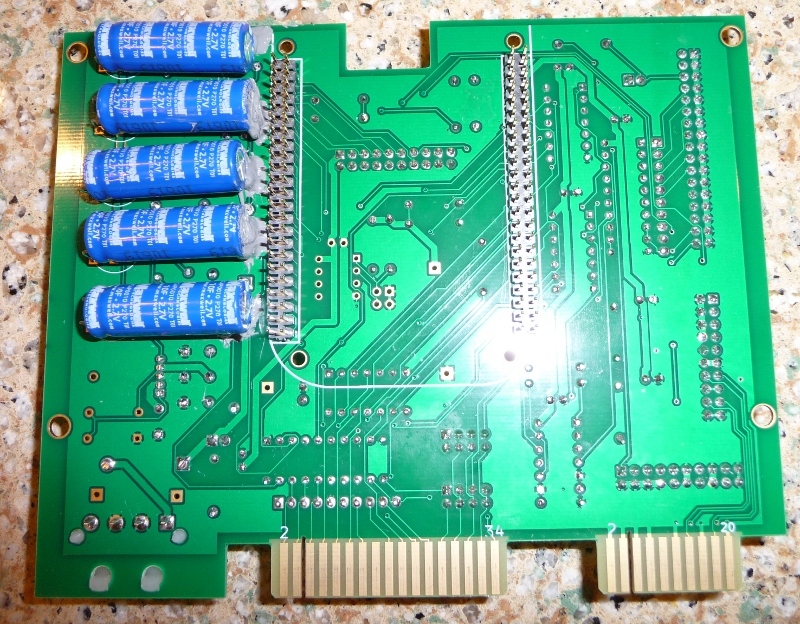 I checked with a sample of the people requesting assembled boards and all preferred them so the assembled boards will have shrouded headers for all connectors similar to the black ones shown. They will be blue since I think that part had a better plating. I will be putting up updated assembly information shortly. The production order will have hard gold edge fingers which will withstand more matings and chamfered edge to allow easier mating of connector. Email me at address at bottom of page if you are interested. 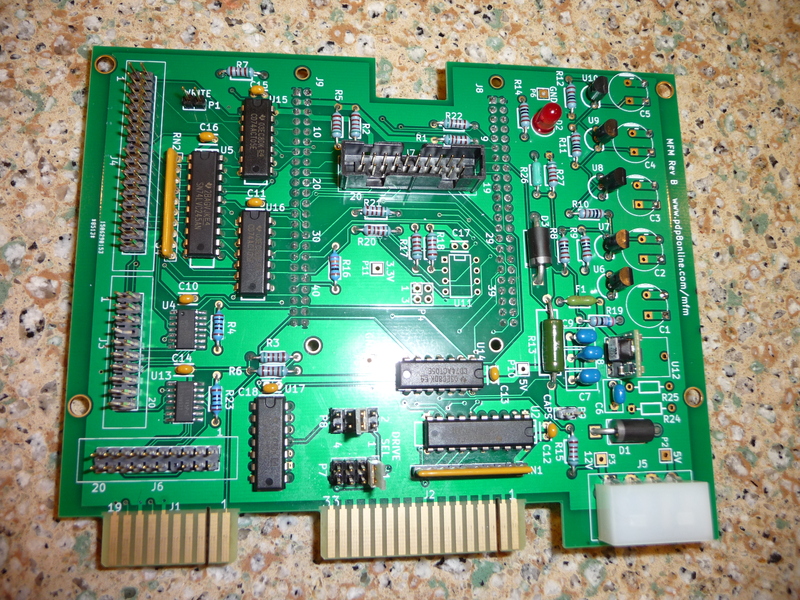 The top page for mfm emulator information is here. 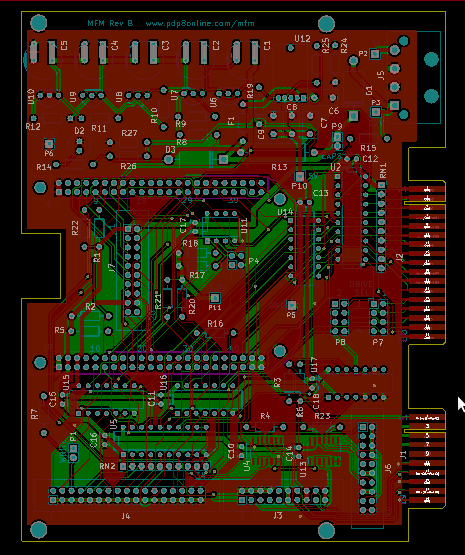 The layout for the next order of boards are here Under each version the pdf directory has the schematic (top.pdf) and plots of the board layers. The bom directory has the bill of material. The board is released under the Creative Commons Attribution-ShareAlike 4.0 International Public License.. I have made the following changes. Changes that just fix errors listed listed here are not listed on this page. IC added to power on BeagleBone Black (BBB) if it is powered down and capacitors have power. This is to prevent short power outages leaving the board powered off when the power is turned back on. Termination/pullup resistors changed to 150 ohms to 3.3V instead of 220/330 ohms between 5V and ground. This reduces the power draw of the board so the capacitor run time is extended. It also allows proper operation if the BBB is powered by a battery instead of using the capacitors on the MFM board. The original terminator was equivalent of 132 ohms to 3V. I went with the 150 ohms that ESDI used since it gives the same load on the drivers. J7 pinout changed to reduce the probability of damaging the board if an expansion cable is plugged in backward. The power and ground on pins 19 and 20 were moved to 18 and 19. The power and ground on 1 and 2 were not changed. The MAX3079E DIP part changed to surface mount. This allows several faster parts to be used. This may allow the board to be used for RLL drives at some future time. Significant code changes will be needed for this which I can't estimate when I will have time to start or even if it will be successful. The resistors to allow clean power up and down of LDO03C have been added. J6 orientation has been changed to match J1. The drive select for emulation has been changed to jumper blocks with permanent termination resistors to match real drives. The J7 expansion connector pinout has been changed some to use pins that provide more function. SPI, I2C, TTL serial, and GPIO are now provided. See spreadsheet for pinout and function. Jumper added to allow capacitors to be disabled. If the board is being used to read disks or when moving around for testing having charged capacitors is not desirable. Automatic power on is now using voltage on capacitors instead of 12V input. This allows power off command to power off the BBB without it powering on immediately when input power is present but capacitors are disabled. Power holdup capacitor layout changed so they mount better on the back side of the board. Capacitors up to 35 mm long and 13.6 mm diameter can be used (15F). C5 over 13 mm diameter will overhang the edge of the board. The hole pattern for 3F capacitors has been removed and instead a second set of holes added to allow more room for the capacitors on the back side of the board. With the 10F capacitors the holdup time is now around 50 seconds so 15F shouldn't be needed. P8 pin 16 grounded to allow detection of revision B boards. The 422 transmitter is turned off while data is being received. Ground copper pour to reduce ground noise. 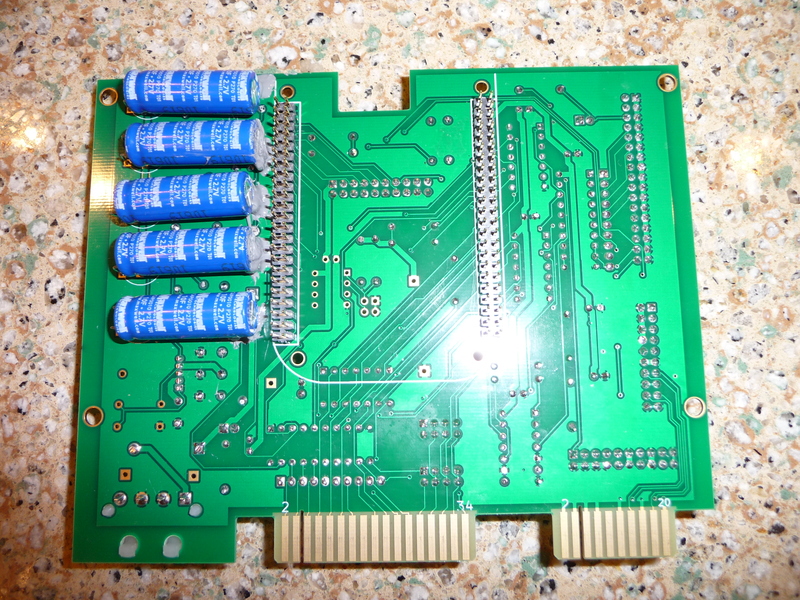 Note that LCD pins are used by this version so the BBB HDMI output will not be usable. Here is a layout picture. Have a jumper than can be installed to quickly discharge the capacitors. Make sure if the jumper is left in when the board is powered up the resistor won't become crispy. 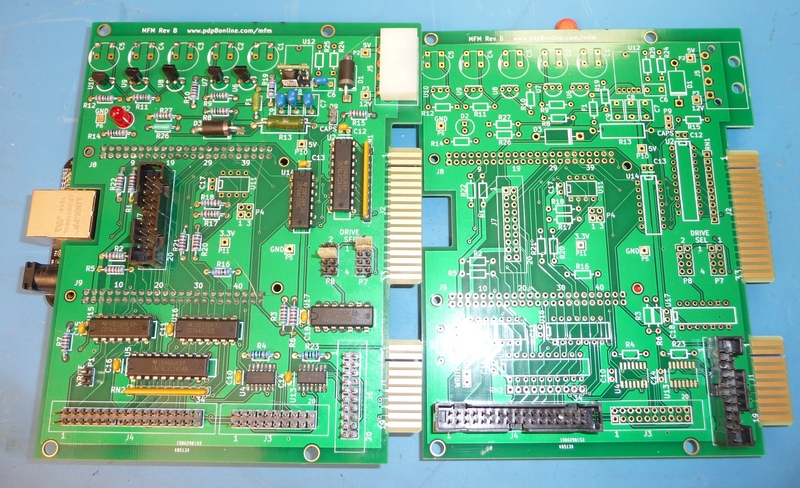 The holes in the MFM board aren't the same size as the holes in the BBB. The trace between C1 and C2 is 10 mil. This has the advantage of acting as a fuse if excessive current goes through the capacitors such as from shorted capacitors. The trace is sufficient to handle the turn on current though if it has a thin spot it might open. Should real fuse be used, width adjusted, or ok? Probably should change so bleed resistor stays attached when trace opens.